“First five years of education is the main pedestal of the students which indicates whether future generation will be shaped in a proper way. The quality of current education system as well as education rate is being increased day by day. 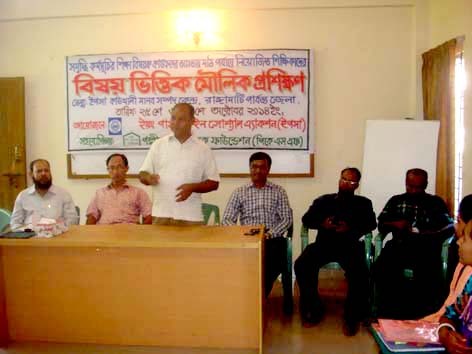 Teachers, guardians and people from all corners should come forward to ensure quality of education” Speakers said in an inaugural ceremony of a basic training workshop for the field level teachers organized by YPSA with the support of PKSF on 25 October 2014 at Kowkhali. YPSA, under the ENRICH program, has taken steps to bring deprived children of poor and illiterate people in the isolated areas into educational support program establishing education support centers. Initially, 20 centers will be conducted in the Kalampati Union of Kawkhali. Students will enjoy educational support for 2 hours daily in the afternoon under a local teacher. A total of 20 teachers have received this training and headmasters of different primary schools enlisted by Education Department conducted the training workshop as master trainer. UP Chairman Mr. Kajai Marma, Upazila Education Officer Mr. Parinoy Chakma, Program officer of YPSA, Mr. Jashim Uddin were present in the inaugural ceremony.